POLAPRIME 2 is an aquaborne, single component PVC/acrylic primer that is highly effective over asphaltic and cementitious surfaces. It penetrates deeply and coalesces to promote superior adhesion of the coatings to be applied. 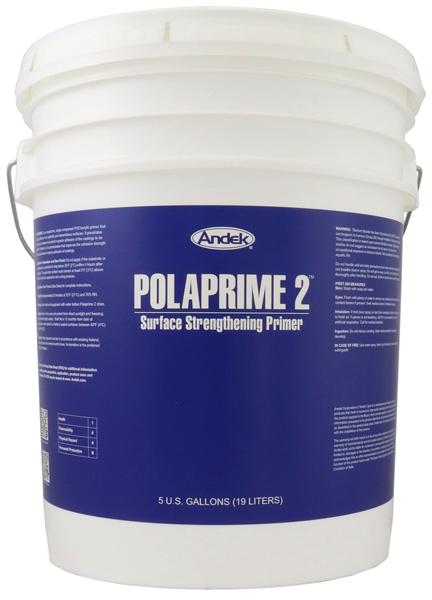 POLAPRIME 2 is a primer/sealer that improves the cohesive strength of weak substrates to improve adhesion of coatings. Application temperature must be above 45°F (air temperature) and the surface temperature must be 5° above dewpoint for thorough drying to occur. Drying time is in the range of 10 to 30 minutes, depending on temperature and humidity. Stir thoroughly for 3 minutes, then keep the can covered whenever possible to prevent contaminating the primer. Apply by spray, roller, or brush. Roller and brush techniques provide best penetration and performance results. For roller application, use a medium or short nap roller. For brush application, use a nylon bristle brush. Apply POLAPRIME 2 only to cover the surface. It is not advisable to pour POLAPRIME 2 straight onto the surface. Apply the appropriate surface coating as soon as possible after thoroughly drying to prevent contamination of the surface, ideally within 2 days. If the POLAPRIME 2 has been left exposed for more than 7 days, the surface must be cleaned thoroughly to remove all dirt and contaminants. As soon as the POLAPRIME 2 is touch-dry, it may be coated immediately. Approximately 20 minutes at 70°F and 70% RH. Clean tools and equipment with water before the POLAPRIME 2 dries; after that, solvent cleaning may be necessary. Do not apply POLAPRIME 2 if the temperature is predicted to drop below 40°F within 2 hours of completion of application. 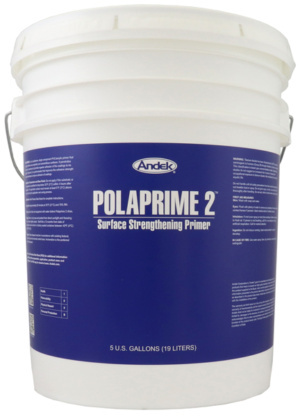 Do not apply any of the POLAPRIME 2 to saturated surfaces or substrates that have ice crystals entrapped. Do not apply if rain is forecast within 4 hours of completion of application.